Burnished copper colour. Thin and long lasting frothy head. Straw aroma. Some citrus hops present. Aromatic. Malt is present in the flavour. Light pine. Subdued bitter to finish. Compex hops. Moderate carbonation and feel. Smooth. A good 'reduced to clear' from M & S.
Dark amber appearance with excellent lacing. Nice foam and different size bubbles on top of the beer right to the end of the glass. Pretty modest but noticeable hoppy aroma. Citrus fruits. Taste is great with high bitterness and very long lingering aftertaste working on different areas of the tongue. Great malt backbone. This is reminiscent of Sierra Nevada Torpedo. Mouthfeel is slighty resinous as a good IPA should be. Overall this is a very good version of an American IPA. A nice big ABV(by English standards) and a high level of bitterness put it in the genuine USA IPA category. 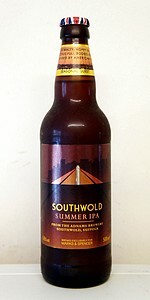 Good work by Adnams who brew this for Marks and Spencer. My mark out of one hundred would be 88. Purchased from the Marks & Spencer supermarket, coming in a 500ml brown bottle; BB 01/2014, served lightly chilled in a straight imperial pint glass. A: pours a translucent, dark reddish amber colour, coming with a light beige foamy head settling to a thin blanket to last, on top of rather mild but healthy flows of carbonation. S: citrussy, honey-ish and overripe fruit-estery comes the aroma upfront, quite settled and not so… lively as such; given a good swirl, more sweet maltiness as in caramelised apples comes forward, as well as Saaz-like hop fragrance and a sound acidity at the back, without any whiff of strong alc. Given the fact that five kinds of American hops are used in the brew, I wonder if they have cancelled each other rather than converged perfectly, hence the relatively “subtle” aroma…? T: soothingly effervescent, quite rich on the palate, the lightly acidic citric-fruity foretaste is reminiscent of a very rich and bitter pale Premium Bitter, tasting quiet in the hop department, though; ensued by a flow of soothing, grassy and almost tea-ish fragrant hop bitterness manifesting in the latter half of each sip, where the bitterness settles deep down the palate with a good weight/intensity, lending a somewhat chewy mouthfeel to the otherwise clean-ish aftertaste, while the remaining aroma of decent crystal malts and/or English pale malts mingles nicely with the grassy and even slightly spicy hoppiness. Again, on the palate the flavour also fails to deliver colourful flavours from “five types of US hops”, although the bitterness from them certainly makes a vivid case here, balanced by a good body of quality malts. M&O: refreshing on the mouthfeel, never too fizzy, medium-plus bodied without going heavy or thick, showing a little warming alc. only after the taste buds are fully in tune with the flavour profile; this IPA is pretty nice and very different than one’s American or English or whatever-style IPA, in my opinion. Enjoyable, in its own way. Half litre bottle, poured into La Chouffe tulip. A: Dark amber, clear, small of white head. S: Initial Maris Otter malt and off fruit gave way to citrus hop. T: Less hop content than expected. Moderate bitterness, slightly fruity. M: Medium body, smooth, moderate carbonation. O: More of an English strong ale than an IPA, didn't seem very summery. In the bottle there is a decent to pretty good American hop nose. In the glass it gives little head but thrown a deep orange copper glow . Rather thin actually with an unfortunate A dirty dark leafy flavour. Bit harsh at the end too. Tried to like this, wanted to but it leaves me thinking Adams should stick to cask sales. Bringing back their Extra would be a start. Big grapefruit aromas, huge hops dancing on your conk. Utterly hoppy hits on the tongue, huge waves of grapefruit and pine smashing over a malt beach. There's citrus in there peppery yeast bites and slight sour notes like salt water taffy. It all stays on the tongue for quite a while. Thick, chewy, solid mouthfeel and spot on carbonation. The beer is foggy orange with an off-white head, good lacing but small curtains. Smelling very lemony, general sweet fruit and some grass. Very refreshing. Starts with loaf of bread, oranges, grass, and lemon peel. Medium carbonation, somewhat spritzy bubbles, soft and with a light dry finish. An easy-to-like IPA, like it should be. Appears ruby red with a decent head, and wonderful lacing. Tastes of hops, quite pleasantly hoppy actually. Not overbearing though still very bitter, but I think that's mostly down to malts balancing it out. Overall a great summer IPA.